A specimen of SCP-924 shortly before acquisition. Special Containment Procedures: All specimens of SCP-924 are to be kept in separate 7 m x 7 m x 7 m saltwater tanks within Site 46. The water is to be kept at a steady temperature of 1.6ºC (35ºF). All observation points are to be constructed of reinforced glass. If a tank must be entered for reasons of experimentation or cleaning, the water is to be heated to a temperature of 7ºC (44.6ºF). Entering tanks outside of these conditions is prohibited. Each SCP-924 is to be supplied with 85 kilograms of fresh meat on a monthly basis. The capture or elimination of wild specimens of SCP-924 is to be carried out by Special Task Force Τau-2 “Polar Pathfinders”. Description: SCP-924 is a species of pale humanoid measuring approximately 2 meters (6.5 feet) in height. The entities have the appearance of a waterlogged human corpse, with the addition of several bony, antler-like growths on the head and a set of external gills located just below the rib cage. They are capable of swimming at speeds up to 30 km/h and surviving at depths of up to 1 kilometer. SCP-924 requires a near-freezing arctic environment to function properly, and will lapse into a state of estivation if the water around it rises above 4ºC (39.2ºF). SCP-924 is an ambush predator, attacking prey from underwater using either a hole in the ice as an appropriate ambush location, or by simply breaking through the ice itself. SCP-924 is highly sensitive to both smell and vibrations, allowing it to track prey from significant distances or through the ice. If the attack is successful, the target is promptly drowned by SCP-924; following this, the body will be dragged down to the ocean floor by SCP-924 for consumption. SCP-924 will release drowned bodies after 1-6 hours. Recovered bodies show all signs of prolonged submersion and high pressure, as well as liquefaction and consumption of internal organs and muscles. Bodies will also contain high levels of virulent bacteria, which, when exposed to the human body, will break down most types of connective and muscle tissue, while leaving skin and bones unharmed. Bacteria will remain active within the body for up to two weeks after feeding. 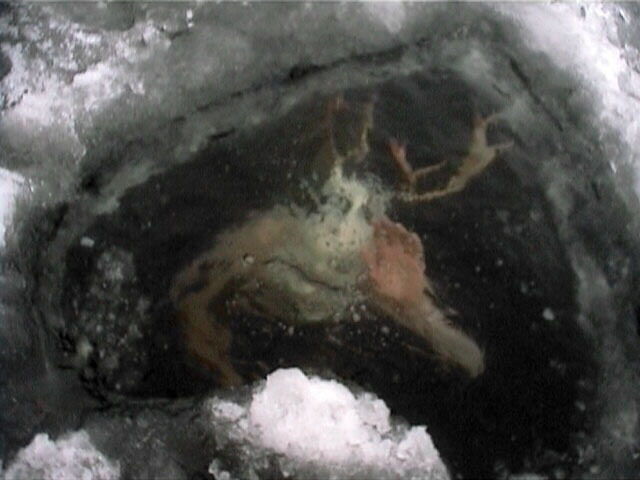 SCP-924 was first recorded as a series of mysterious disappearances of ice fishermen in the area around [REDACTED]. While the species requires a below-freezing environment to function properly, as its internal activity lessens as the temperatures around it increases, it has been known to migrate south during the winter to find prey. The southernmost encounter with an SCP-924 was approximately three miles outside ████████, Michigan. Addendum: An incident on ██/██/20██, while resulting in no casualties, proved that SCP-924 are capable of supporting themselves and moving outside of water, and that attacks on unwary fishing vessels are possible. Special Task Force Tau-2 has revised their protocols accordingly.